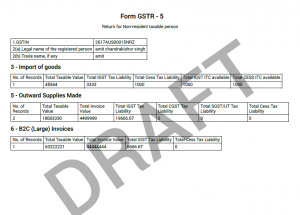 GSTR 5 is now open for filing – How Non-Resident can file GST return ? A non resident taxpayer is an individual who sporadically does a transaction involving the supply of goods and services or both. He makes those transactions wither as principal or agent. He can also make the transaction in any other capacity but would not have a fixed place for business in India and neither the residence. All those non-resident foreign taxpayers who do not reside in India but occasionally make transactions, supply goods for a short period of time are liable to pay the tax. What Are the Prerequisites ? Individual should be a non resident foreign taxpayer who does not have any business establishment in India. Click theServices > Returns > Returns Dashboardcommand. 4.On the File Returns page, select the Financial Year&Return Filing Period (Month) for which the return has to be filed. 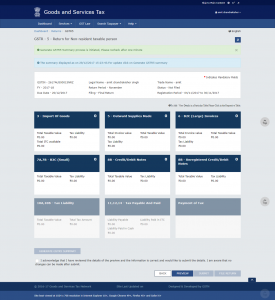 Generate GSTR Summary by clicking the GENERATE GSTR5 SUMMARY button on the GSTR-5 – Return for Non-resident taxable person page. 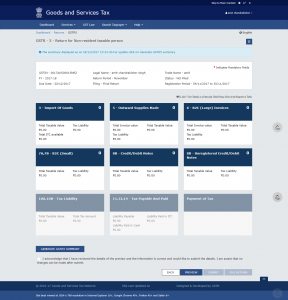 The details about the auto drafted supplies of goods &services page would be displayed. 11.Thereafter, Preview of the GSTR 5 filing can be accessed by clicking on Preview button. Upon Clicking the Button GSTR-5 summary page would open which can be downloaded and reviewed. The PDF file will have watermark of draft as the details are yet to be submitted. Tick the Acknowledgement check-box which states that the tax payer has reviewed the information and finds it to be correct. Once the Submit button is Clicked, no changes can be made. http://www.knowinfonow.com/wp-content/uploads/2016/06/logoik-e1482386591353.jpg 0 0 Publisher http://www.knowinfonow.com/wp-content/uploads/2016/06/logoik-e1482386591353.jpg Publisher2018-05-07 10:08:492018-05-11 07:27:17GSTR 5 is now open for filing – How Non-Resident can file GST return ?